Let's welcome Holly from Down To Earth Style this week. Thank you, Kim, for having me over to share my favorite room. To be honest, my favorite room is which ever one happens to be clean at the moment. Our family room is the most used space in our home. None of our furniture matches but it is all very comfortable. The color pallet is very neutral. A seasonal color can be easily added in. This time of year I like to bring in fresh flowers and colored throw pillows. Changing out the decor is really fun. Since this room is one of our largest spaces, our big up-cycled windows are used as backdrops for the fireplace mantel and for the TV entertainment area. 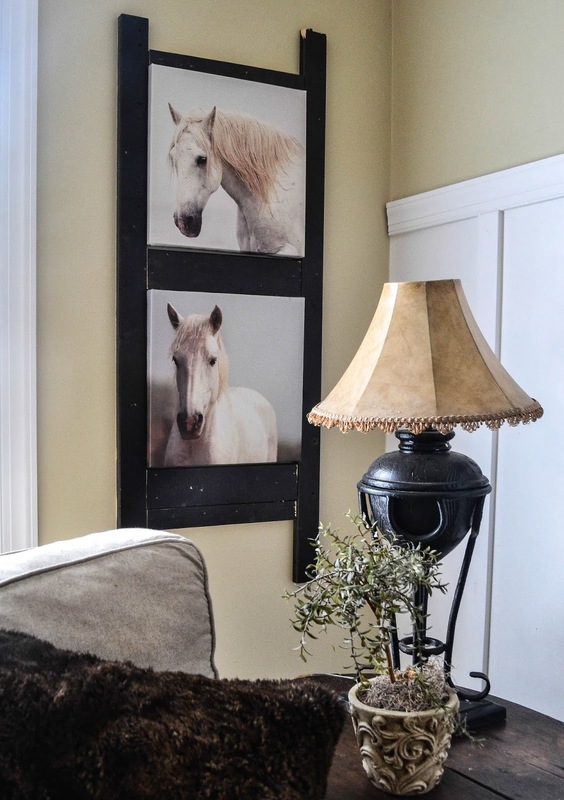 Mostly I like to display pictures of our family but I have a love for pictures of horses too. All the end tables are up-cycled. Actually, two of them are old crates tipped sideways. 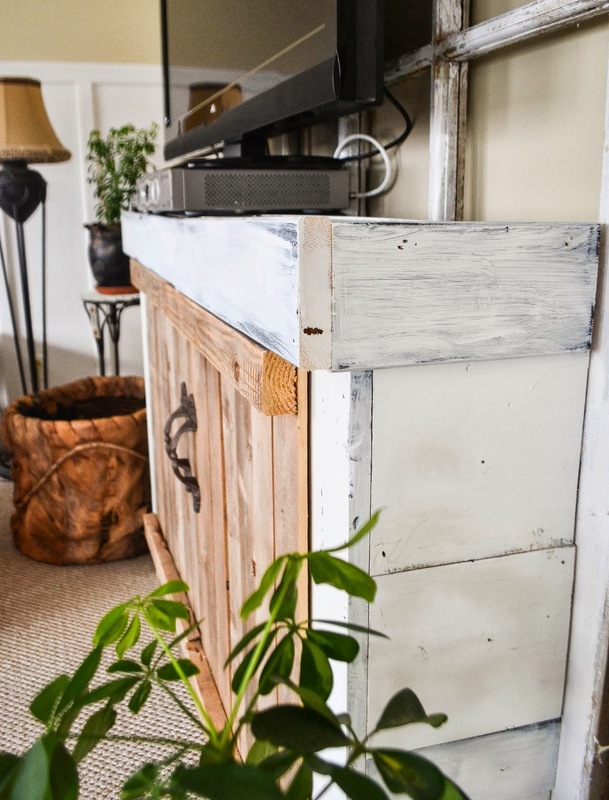 The entertainment console is my very own creation featuring an old fence to look like doors. Fresh plants are the added color for most of the year. 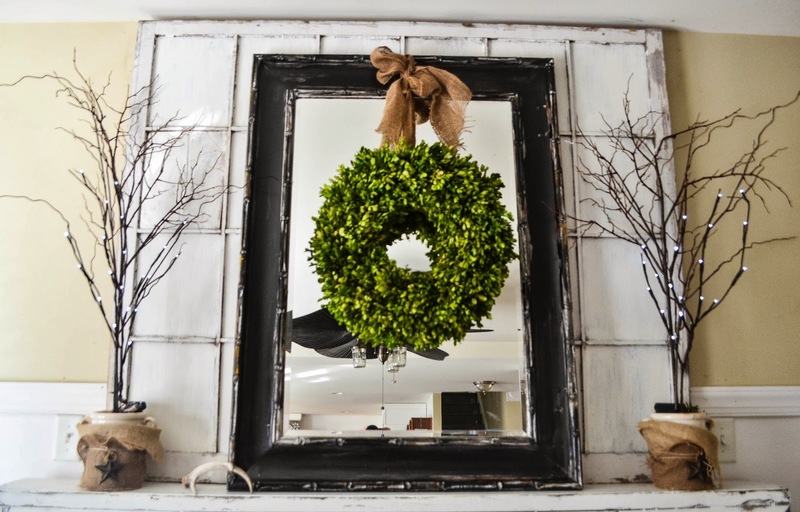 Greenery freshens up any room and makes it cozy and alive. Why is this room my favorite space? The best family time is spent here and we can all relax. The sofa and chairs are slip covered and can be washed so we can bring food and drinks and even wear shoes, what ever we like. We live here. Thanks for viewing my favorite room. Thank you Holly for opening up your home for us. I sure hope y'all will go over and say hi to Holly at Down To Earth Style if her blog is new to you. Thank you Holly & Kim for sharing this lovely room with us! I love the console ... very clever design. It fits the room perfect. The neutrals are all very soothing without being boring. Nicely done. I can see why this is a favorite room. I hear you Holly when you say your family room is lived in. That is our living room, washable slipcovers, unmatched furniture and cast off end and coffee tables. You have really pulled together a beautiful living space. 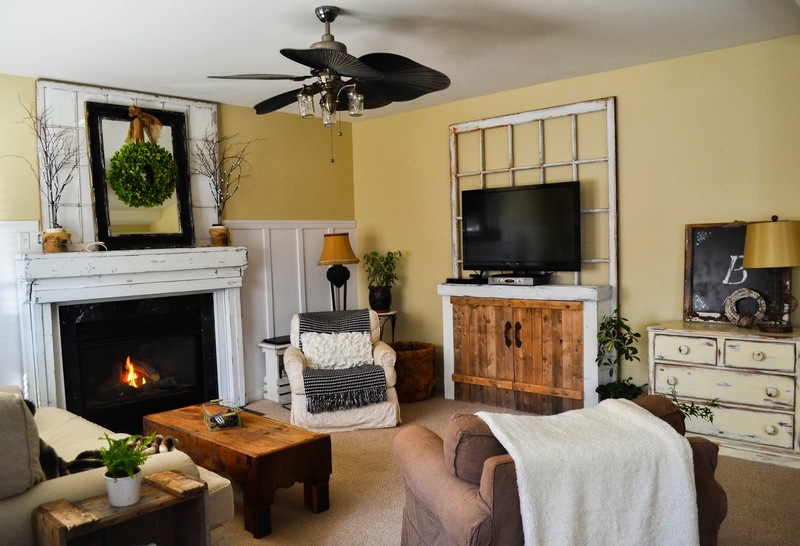 I love the idea of the crate-on-end end table and I am also loving those paneled walls, it makes the room that much more cozy. 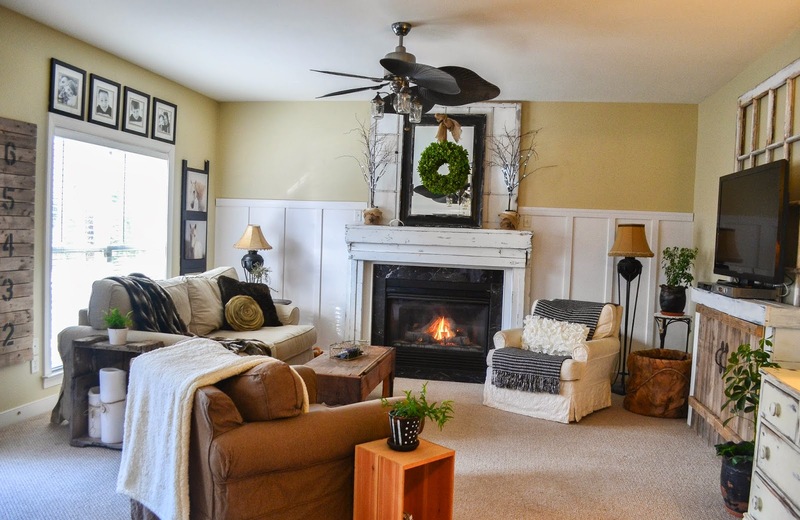 Thank you so much Kim and Holly for sharing this lovely family room. Wishing you both a wonderful weekend! I love Holly and her beautiful home...She is so very creative...just love her TV cabinet and the backdrop...She always presents such great ideas and so lovingly decorates her home for her family..A great feature today!! !...Happy Spring Kim and Holly!!! Fantastic feature today Kim!!. z;) abut then I luv Holly's style. Her creativity shines through along with her luv of family. Holly amazes me!! She is so incredibly talented and I always enjoy seeing what she's up to. She has the most fabulous architecturals as well. Love all the personal details in this comfy room!! Holly's room looks like a wonderful place to settle in an relax. Love the way she uses old windows! Holly, I am such a fan of yours and I love love love your style! You do neutrals right!!!! This is a room I would be so happy to live in! Relaxed, and welcoming and very fresh! Keep your wonderful decor posts coming! I read almost every one! Kim, thanks for featuring one of my favorite bloggers! Thanks Kim for featuring Holly. I love her family room. I love that she is not matchy matchy with things. That room is so inviting and just says hey grab a comfy seat and enjoy. Love all her wonderful pieces in this room. Beautiful. I'd have Holly come decorate any room in my house anytime! Love this space, so pretty and natural! :-) Thanks for sharing in the inspiration, I hope you both have a great day. Very creative...love the raw wood and down to earth feel! Thanks Kim and Holly. I hear you when you say it's lived in. I see so many blogs that look so pristine that I feel like I can't even compete. Two Golden Retrievers make lots of hair so I am always cleaning. You home looks lovely and oh so comfortable. Thanks so for sharing your home. Happy Weekend to all! 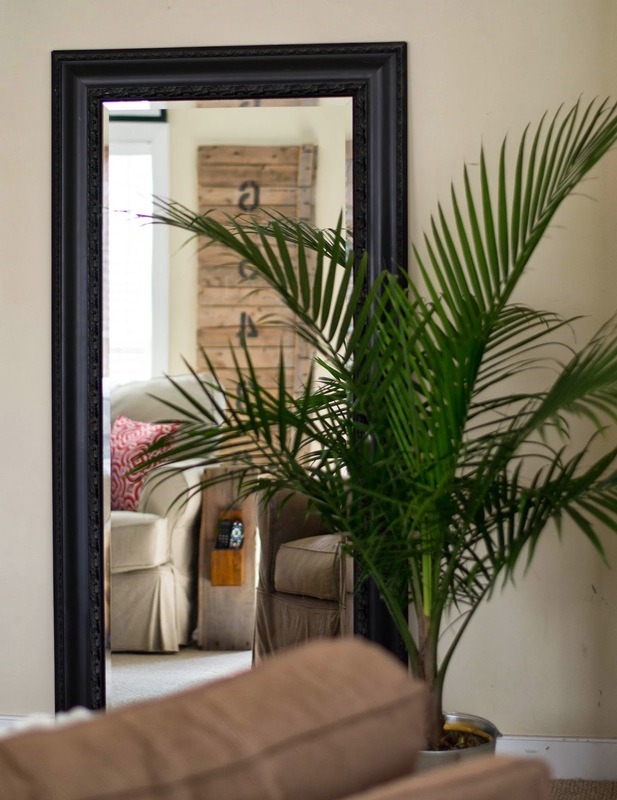 I love Holly's talent and ideas she comes up with to add to her décor. She really has nailed it in her family room. She truly always amazes me. I follow Hollys blog. I always enjoy seeing all of her latest creations. 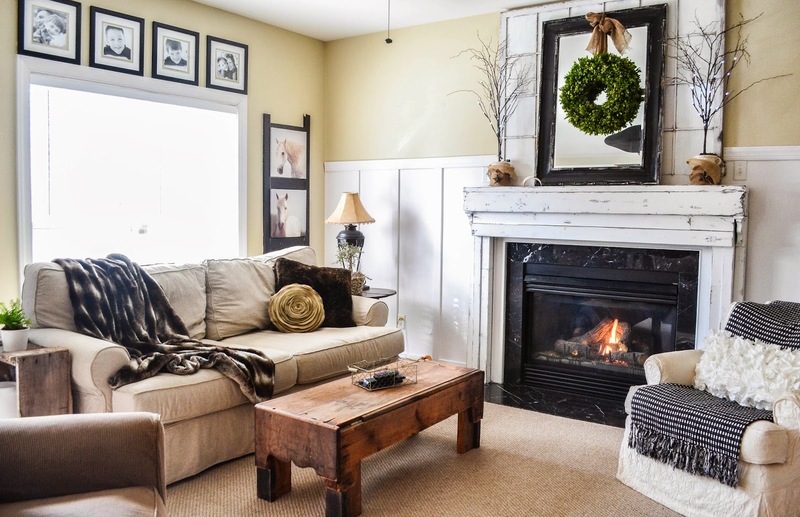 Her family room is very cozy and looks like it is just right for her family. So nice to see her being featured. Looks so very comfy and cozy! Thank you Holly and Kim for sharing. Holly, you have given me an idea of what to do with my TV over our mantle. So much I could do with an up cycled window frame behind it. Now to find the frame. haha. Your room looks really pretty and comfy. Love the colors. 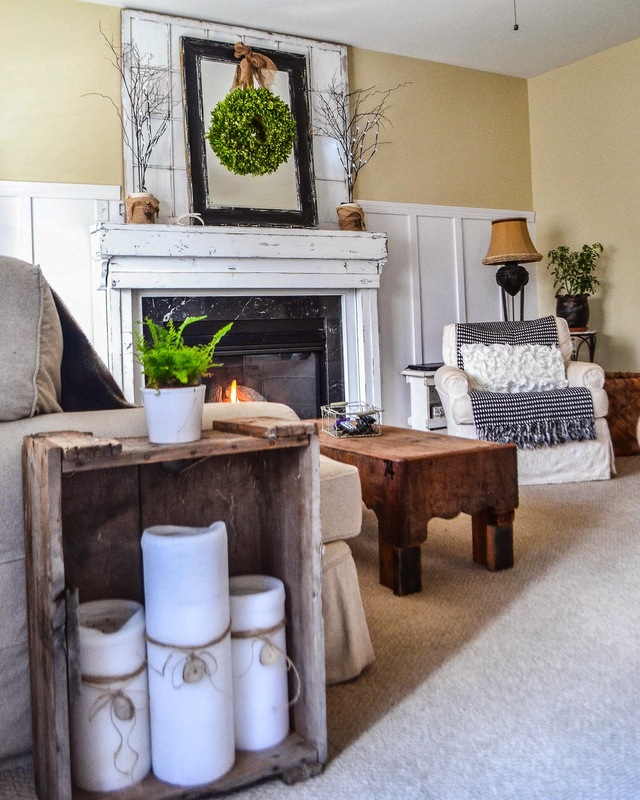 Holly's living room looks so comfortable and well lived in! That's the way our living room rolls, eating, drinking, wearing shoes is all allowed ;) I love the old windows and the skinny door with such wonderful patina! I've been following Holly and all of her great projects. It's nice to see everything in one place here. 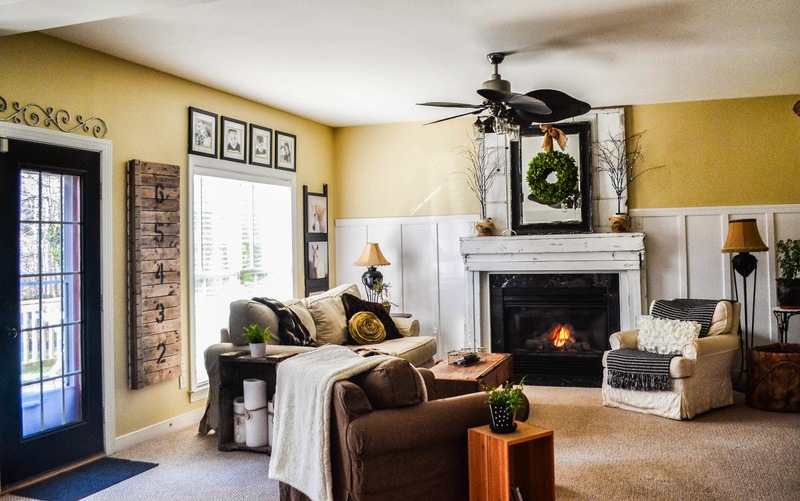 It is a lovely, comfy and cozy - looking room! What a great feature, Kim. Holly has such a creative bent. She is an inspiration and a whiz with a power tool. Have a great weekend. Thanks for sharing Holly's home with your readers Kim. I'm such a fan of hers and her comment about her favorite room being the clean one says it all. She's always so real and genuine. And it shows in the cozy, warm way that she decorates. 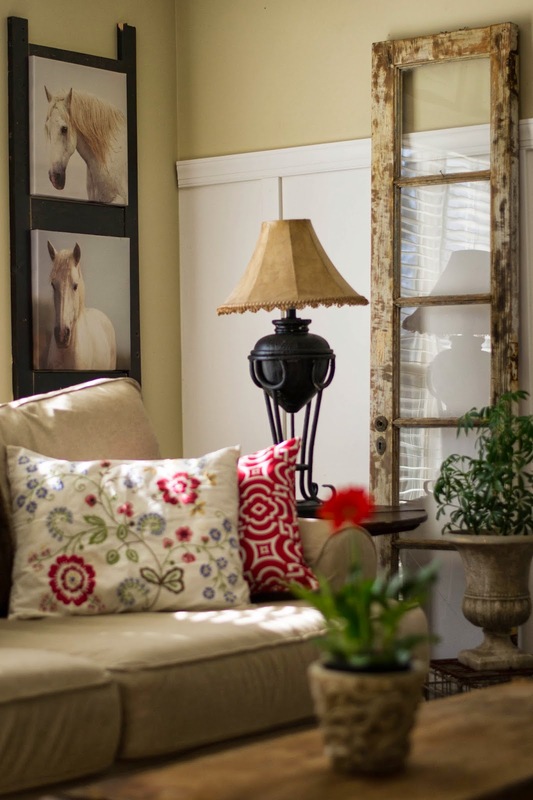 Holly's home decor looks so relaxing and inviting! Love how she used those crates, so clever! I'll head over to see her right now! Thanks Kim! Thanks for sharing Holly's home today, Kim. She always has great ideas and her home looks so comfy and creative. holly has such a fabulous style--tfs!